at the Terrace Hotel in Lakeland, Florida! As Lakeland, Florida's only full-service, luxury hotel, The Terrace Hotel has been beautifully restored, providing a glimpse into Lakeland's own history. 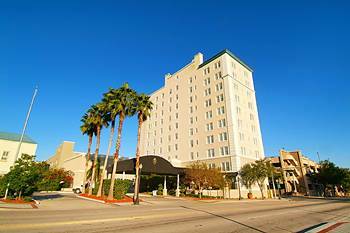 Considered by many to be the centerpiece of downtown Lakeland's rebirth, The Terrace Hotel is home to exceptional comfort and exquisite accommodations. Our goal is, and always has been, to provide each and every guest with a truly unforgettable, equally restful, experience. There are promises we make to each guest of The Terrace Hotel. That your experience will be unlike any other. That you'll be greeted by welcoming comfort. That, regardless of where you stay in our hotel, you'll be surrounded by uncommon hospitality and be regarded as a welcomed, trusted friend. 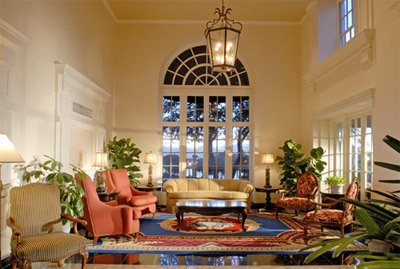 Each day at The Terrace Hotel, we strive to live up to your expectations, as well as that of our distinguished history. That is why, in addition to exceptional service, The Terrace Hotel's 73 spacious guest rooms come fully equipped with luxurious, executive-level amenities. Guests residing in any one of our 15 oversized guest suites will enjoy private bedrooms, plus the added comfort of a sofa bed in the sitting room. The Terrace Grille offers the finest in nouvelle American cuisine in an elegant setting of masterfully restored ceilings, period fixtures, and sweeping views of the hotel's interior to provide a truly enticing backdrop to a delightful menu. Deluxe Room: Also Featuring: - Spacious Workspace - Two 100 % Cotton Robes - Luxury linens and terrycloth Bath Towels.